I saw this picture recently of a crowd sitting in lawn chairs along a parade route. In the background, a military formation is marching by carrying our flag. 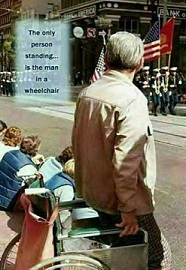 Sadly, the only one standing in a show of respect is a veteran in a wheelchair. That bothered me, so I wrote this to give yesterdays hero the recognition he deserves. To all our veterans, thank you for your service and my freedom. Slowly the crowd parts, some reluctantly, others without hesitation. The woman pushes the wheelchair forward, smiling as she navigated the narrow opening provided for their passage until they reach the curb. Here is a man of great wisdom–born of experience–and heart! I loved this story; it is so true to see the younger generation not respecting the flag in parades. I agree. I think you’d like oldmainer’s site, too.